We recognise our membership as a powerful resource of expertise, and organise twice-yearly TravelWatch SouthWest General Meetings which keep everyone abreast of developments and ideas. Speakers are invited from government agencies, the transport industry, including bus and train companies, airports and ferry operators, providing insight into the key issues affecting passengers. At these events, delegates may enter into the discussion, helping to locate and progress service improvements and to ensure that public transport is given the high profile that it deserves. Thank you to all our members who made up the very strong turnout for our Spring Meeting in Taunton on Wednesday 20 March 2019. Giles Fearnley, First Group was eloquent as ever in delivery of the keynote speech “The Future for the Bus?…….Why I am optimistic”. Some remarkable statistics came through, indicating the increasingly crippling impact of congestion, but also directing us to sustainable solutions attainable through partnerships. Members impressed industry speakers enough to stimulate the creation of two exciting new projects enabling continuous engagement between industry and stakeholders, watch this space…..
“Just a minute slots” were full and topic short articles on each can be read on our linked “just a minute” page which will be up later in the week. 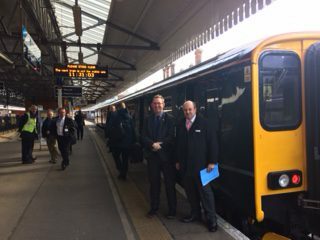 Thanks to Stagecoach and Go-Ahead for enabling members to reach the meeting in Taunton by providing free buses from Exeter and Bournemouth. And of course, thanks to GWR for their continued support which recognises the significance of this single forum for South West regional stakeholders. High numbers were drawn by the day’s theme, “An integrated transport system which includes public transport is key to the three pillars of sustainability essential to a thriving South West”. Delegates provided interesting questions, commented in “Just a Minute” and discussed stimulating and informative presentations from; Mike Watson, Regional Director England & Wales, Stagecoach; James White, West of England Combined Authority; Alex Carter First Bus in conjunction with Cornwall Council; and Christopher Irwin , TravelWatch South West. The TravelWatch SouthWest AGM took place in Exeter on November 30 2016 and Nick Buckland OBE is welcomed to the Board. Would you like to come to the next TravelWatch General Meeting?